Art on display at Wylam. To ward off the winter blues, the Northumberland village of Wylam stages ‘Wylam Winter Tales’, an annual series of art events. This year’s series of events took place over eight days, 24th January – 1st February. 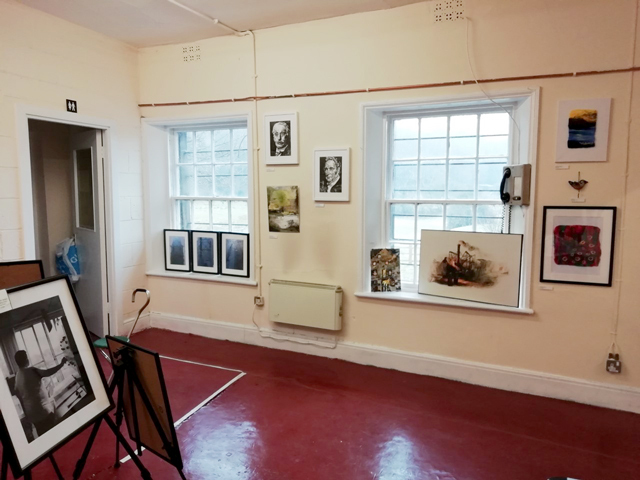 This year the Tyne Valley Community Rail Partnership together with Network Rail have joined this event by staging a pop up art display housed in the old station buildings at Wylam. This consisted of pieces of artwork on a railway theme generated by the local community and a collection of reproduction posters from the 1840s which have been donated to the TVCRP from the P.R.B. Brooks collection. The room, staffed by volunteers was open 10:00 – 12:00 and 17:00 – 19:00 to catch the commuters returning home. The room used for the pop up display is not normally available to the community as it is classified as a welfare hub for those who are working on the track. However, our local Operations Manager, Alex Bateman very kindly allowed Wylam Winter Tales the use of the room. The original 1835 building at Wylam station is possibly one of the oldest stations in use today. It is grade ll listed and is a neo-Tudor style with the Newcastle & Carlisle Railway trademark cross gable upper window projecting on corbels. The section which housed the exhibition was in an extension built in 1860. A full upper floor was added in the same neo–Tudor style in 1897. The platforms were added after the station opened and are staggered across the level crossing. As a reward to the volunteers a tour of the signal box was arranged. The signal box perched high above the tracks won a National Rail Heritage Award in 2003. The key for the building had to be collected and returned to the signalman and this meant a steep climb up to the box. However, it was worth it. The interior of the box is a modern push button affair, gone are all the heavy levers and operating the crossing gates is another push button system but the opening of the gates after the train has departed is entirely automatic. The station is in a very attractive rural setting and in the early mornings an added bonus for the signalman is to be able to watch the wildlife: deer, red kites and buzzards who live close by, or watch the salmon in the river. “Thanks for the exhibition we particularly enjoyed the railway posters”. 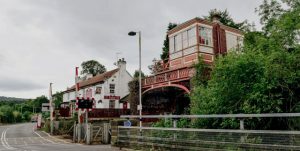 “Excellent idea to promote Wylam and its industrial/railway heritage represented in art”. “Good idea – hope we can find a use for the buildings”. Excellent exhibition, nice warm room, friendly reception, varied media with good standard of work”. The community of Wylam and the TVCRP wish to express thanks to Network Rail for allowing the use of the facilities during the event.